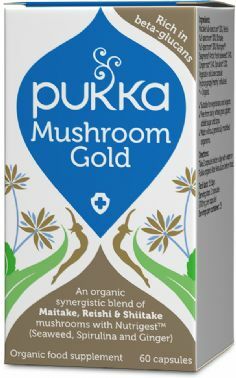 Mushroom Gold is based on three edible mushrooms – organic Maitake, Reishi and Shiitake. Mushrooms have been used for centuries to help support a healthy ecosystem. We ensure that the fruiting body and mycellium as well as the extra-cellular metabolites are blended to deliver the concentrated polysaccharides and beta-glucans. This broad-spectrum formula contains the highest organic grade, sustainably cultivated herbs, carefully selected to bring you the full potential of nature’s goodness. Maitake full-spectrum* 30%, Reishi full-spectrum* 30%, Shiitake full-spectrum* 30%, Nutrigest™ Seagreens® Arctic fresh seaweed* 3.4%, Ginger root* 3.4%, Spirulina* 3.2%, Vegetable cellulose capsule (hydroxypropyl methyl cellulose). * = Organic Suitable for vegetarians and vegans. Take 2 capsules twice a day with water or Pukka organic Aloe Vera Juice before food.